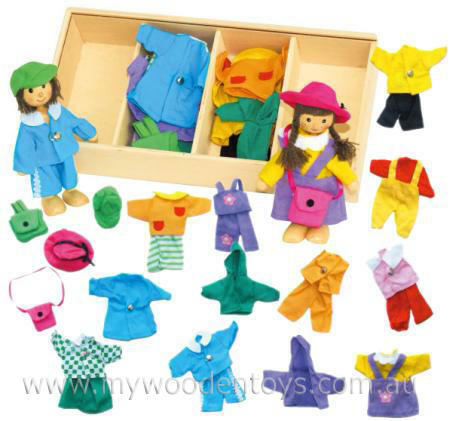 Boy and Girl Dress Up Wooden Dolls are two wonderful little dolls complete with 16 outfits and accessories. This is a beautiful toy with very well made and detailed clothing. This is a great toy which will provide hours of imaginative play. The little girls arms and legs are made of stiffened, bendy rope with round hands at the ends so they are easy to get through sleeves and trousers. A wonderful toy to help develop fine motor skills , this little boy and girl are just waiting to go on their first adventure. Size: Box is 27cm by 13cm by 5.5cm. Boy and Girl stand 11cm high. Material: Wood, cloth, child-safe paint. Perspex lid. We like this because: "We love the fantasy games this toy encourages as the little boy and girl go on adventures together." Dear Doug,Thank you SO MUCH for doing this for me! You have saved me much stress. I really should have shopped sooner but only found your site on Saturday and fell in love with all your toys. It is really nice to see that good customer service is alive and well. I will definitely be a return customer and will tell the mothers in my mothers' group about your site.